In simple words its a phenomenal thing , that will revolutionize internet telephony . Also it will emerge to be platform independent ( ie any browser , any desktop operating system any mobile Operating system ) . WebRTC allows anybody to introduce real-time communication to their web page as simply as introducing a table. Currently VP8 is the codec of choice since it is royalty free. In mobility today, the codec of choice is h264. H264 is not royalty free. But it is native in most mobile handsets due to its high performance. 6716, a reference implementation is provided under the 3-clause BSD license. All known software patents Which cover Opus are licensed under royalty-free terms. G.711 is an ITU (International Telecommunications Union) standard for audio compression. It is primarily used in telephony. The standard was released in 1972. It is the required standard in many voice-based systems and technologies, for example in H.320 and H.323 specifications. significant content is out there using Speex, it will not disappear anytime soon. G.722 is an ITU standard 7 kHz Wideband audio codec operating at 48, 56 and 64 kbit/s. It was approved by ITU-T in 1988. G722 provides improved speech quality due to a wider speech bandwidth of up to 50-7000 Hz compared to G.711 of 300–3400 Hz. AMR-WB Adaptive Multi-rate Wideband is a patented wideband speech coding standard that provides improved speech quality due to a wider speech bandwidth of 50–7000 Hz. Its data rate is between 6-12 kbit/s, and the codec is generally available on mobile phones. WebRTC offers web application developers the ability to write rich, realtime multimedia applications (think video chat) on the web, without requiring plugins, downloads or installs. It’s purpose is to help build a strong RTC platform that works across multiple web browsers, across multiple platforms. Web API – An API to be used by third party developers for developing web based videochat-like applications. 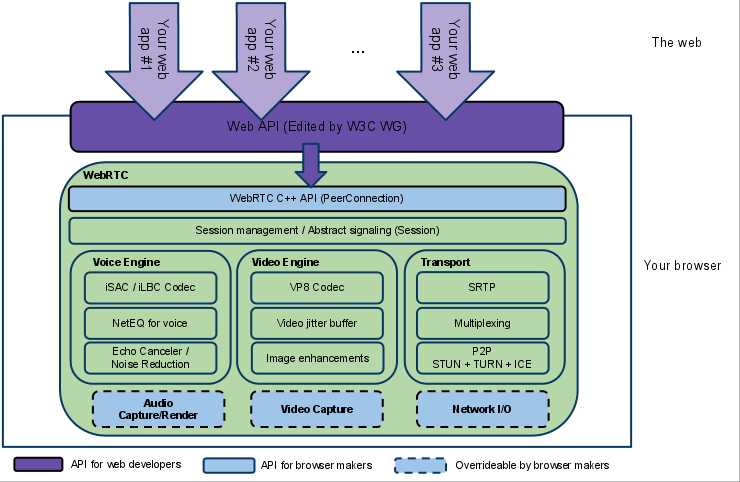 WebRTC Native C++ API – An API layer that enables browser makers to easily implement the Web API proposal. The session components are built by re-using components from libjingle, without using or requiring the xmpp/jingle protocol. RTP Stack – A network stack for RTP, the Real Time Protocol. STUN/ICE – A component allowing calls to use the STUN and ICE mechanisms to establish connections across various types of networks. An abstracted session layer, allowing for call setup and management layer. This leaves the protocol implementation decision to the application developer. VoiceEngine is a framework for the audio media chain, from sound card to the network. iSAC: A wideband and super wideband audio codec for VoIP and streaming audio. iSAC uses 16 kHz or 32 kHz sampling frequency with an adaptive and variable bit rate of 12 to 52 kbps. iLBC: A narrowband speech codec for VoIP and streaming audio. Uses 8 kHz sampling frequency with a bitrate of 15.2 kbps for 20ms frames and 13.33 kbps for 30ms frames. Defined by IETF RFCs 3951 and 3952. Opus: Supports constant and variable bitrate encoding from 6 kbit/s to 510 kbit/s, frame sizes from 2.5 ms to 60 ms, and various sampling rates from 8 kHz (with 4 kHz bandwidth) to 48 kHz (with 20 kHz bandwidth, where the entire hearing range of the human auditory system can be reproduced). Defined by IETF RFC 6176. 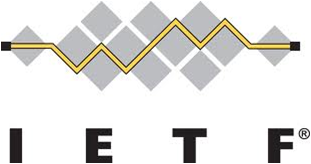 NetEQ for Voice– A dynamic jitter buffer and error concealment algorithm used for concealing the negative effects of network jitter and packet loss. Keeps latency as low as possible while maintaining the highest voice quality. Acoustic Echo Canceler (AEC) – The Acoustic Echo Canceler is a software based signal processing component that removes, in real time, the acoustic echo resulting from the voice being played out coming into the active microphone. VideoEngine is a framework video media chain for video, from camera to the network, and from network to the screen. VP8 –Video codec from the WebM Project. Well suited for RTC as it is designed for low latency. Video Jitter Buffer – Dynamic Jitter Buffer for video. Helps conceal the effects of jitter and packet loss on overall video quality. Image enhancements -For example, removes video noise from the image capture by the webcam. API for connecting processing functions to media devices and network connections, including media manipulation functions. An extension of the Media Stream Functions to process audio streams (e.g. automatic gain control, mute functions and echo cancellation). An extension of the Media Stream Functions to process video streams (e.g. bandwidth limiting, image manipulation or “video mute“). API to query presence of WebRTC components in an implementation, instantiate them, and connect them to media streams.